UK, US, France, Germany condemn spy attack in rare joint statement – Royal Times of Nigeria. 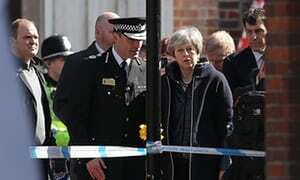 In a rare joint statement, US President Donald Trump, French President Emmanuel Macron, German Chancellor Angela Merkel and British Prime Minister Theresa May say there is no plausible alternative explanation to Russian responsibility in the March 4 attack in England. They say Russia’s failure to respond to Britain’s legitimate request for an explanation further underlines its responsibility. The leaders say the use of a chemical weapon is an assault on UK sovereignty and a breach of international law. Russia is expected to take retaliatory measures soon.